Set in 130 acres of majestic grounds, this world-famous 5 star country house hotel is an idyllic retreat nestled on the edge of the magnificent New Forest National Park, and just a short stroll from the Dorset and Hampshire coast line. 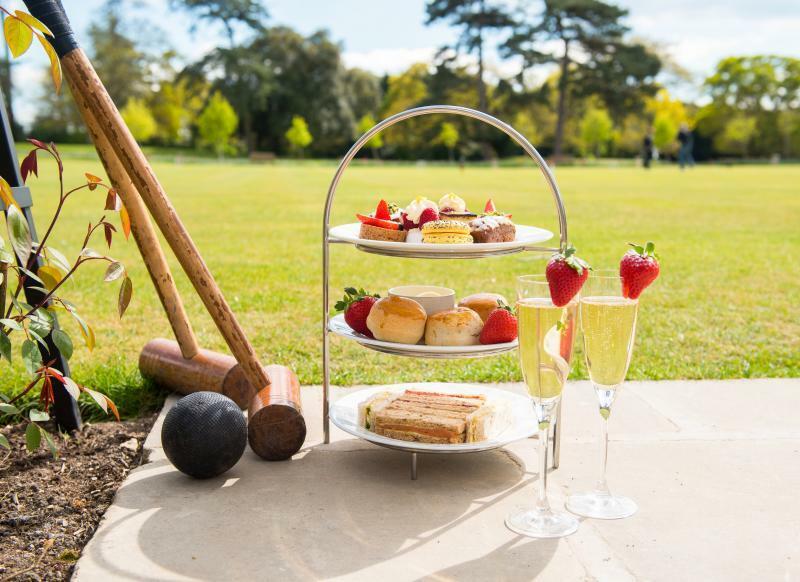 The Chewton Glen has an award-winning restaurant, spa, gym, indoor and outdoor pool, golf course, croquet lawn, four tennis courts and extensive grounds to explore. Clay pigeon shooting, falconry displays and the truly unique experience of duck herding is all within the hotel grounds. Horse riding and fishing in the New Forest can also be arranged. With 72 bedrooms and suites plus 14 treehouses, guests of Chewton Glen are welcomed with first class service, luxury and privacy. Bedrooms are luxurious and delightfully appointed, while public areas are stylish and comfortable, the perfect place for traditional afternoon tea. Guests of Chewton Glen are welcomed with first class service, luxury and privacy. The impressive eco-friendly treehouse suites are set within the grounds, observing their own haven of romance and seclusion balanced on stilts in the woodland, overlooking the quintessentially British countryside. Flourishing in the Kitchen Garden or fresh from the local waters, the Chewton Glen has access to an abundance of produce on its doorstep, and these locally sourced ingredients is used within the hotel's two on-site restaurants; The Dining Room and The Kitchen. Awarded 2 AA rosettes, Chewton Glen's The Dining Room’s menu combines classic British and European with global flavours and excellent variety across a broad menu. Many of the ingredients used by Head Chef Simon Addison, Executive Head Chef Luke Matthews and their talented team have travelled less than 100 yards from the Chewton Glen's own kitchen garden. “The menu is utterly delicious and thankfully avoids the sometimes tortured ‘cleverness of country-hotel dining.” - The judges at The Tatler Restaurant Awards 2018. And with an AA Notable Wine List 2018-19, Chewton Glen was awarded 'Most Innovative Wine List' by Condé Nast Johansens in 2018. The perfect location for foodies, The Kitchen is a relaxed restaurant with a fantastic cookery school supported by celebrity Chef James Martin. The diary is filled with classes to suit all abilities - the perfect place to eat, meet, create and cook. The Kitchen delivers stylish, informal, family-friendly dining in a beautiful purpose-designed space. The terrace, with views over the estate, provides a relaxed environment for al fresco dining. The seasonal menu has been created to showcase local suppliers and produce grown in Chewton Glen’s kitchen garden. Choose from casual classics with a luxurious twist, including wood-fired pizzas, chargrills, gourmet burgers, superfood salads and deliciously indulgent desserts. International wines, craft beers, local spirits and an extensive cocktail list perfectly complement the a la carte dining. For the ultimate in luxury and perfect serenity The Spa has it all. There are few things better than slipping into a fluffy white bathrobe and entering a state of blissful tranquility. Indulge in a heavenly spa treatment, soak away your stresses in the hydrotherapy pool and unwind in the peaceful relaxation room. Your time at the spa can be as full on or laid back as you like. For the energetic there are tennis courts, dance studio, gymnasium, nine hole golf course and a 17 metre indoor pool. If replenishing the mind and body is more your thing, enjoy the hydrotherapy spa pool, nail studio, aromatherapy saunas, crystal steam rooms and twelve individual treatment rooms offering treatments and holistic therapies.